What’s Up with the Kitchen? We might have been keeping you in suspense on what’s going on in the kitchen so let’s talk about that, shall we? So far, our cabinets, granite, oven/microwave, sink, hardware (knobs and handles), and faucet have been installed. The walls have been painted a nice neutral color. The area in the kitchen where we were adding the hardwood has been filled in and has gotten it’s first coat of the stain. Everything is coming together SO beautifully. 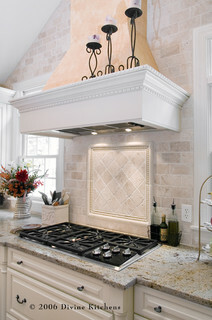 Here’s what we’re thinking for the backsplash over the stove. The only difference is all of our tiles will be square. And, obviously, our cabinets will look completely different and we won’t have that humongous hood. Have you ever remodeled your kitchen? What was your most/least favorite part of the process?